Mountain Bikes Calgary | Where do YOU Get One? Where can you Use it? Search for more about Calgary recreation. Great mountain bikes Calgary scenery, crisp fresh air, and the scent of pine tickling your nose greet you right in Calgary. What better way to enjoy all of this than with mountain biking? Boasting some of the best cycling on the continent, the Calgary area offers visitors and residents some 633 km of pathways and 290 km of bike routes. Be aware before you go mountain biking that Calgary’s laws dictate that the cyclist follow the rules of the road as if you were in a car, adhere to the restrictions that ban bike riding, use safety equipment and check the safety of the bike itself before setting out. What's in Calgary Bike Shops? See the different types of mountain bikes Calgary riders get at over sixty locations throughout Calgary. The varieties to purchase or rent will depend upon the terrain you wish to traverse. Cross Country is the best at climbing and turns with its lighter weight and steeper geometrics, but would be ill advised to use over huge rocks and washed out areas. 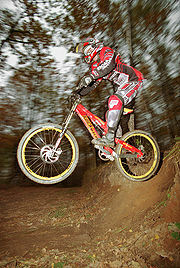 The All-Mountain bike will allow the rider to travel mild to moderate inclines and steep declines. Freeride bikes offer advanced maneuverability and fantastic downhill trail rides. Urban and Street mountain bikes have front suspension and up to nine gears allowing you to use the bike on a multitude of trails. So have in mind where you may want to ride to assure the proper acquisition of the perfect mountain bike for the application. News in the biking world is the release of many new mountain bikes from the Kona and Cannondale lines that add versatility to run the gamut on any trail throughout Calgary and the surrounding areas. Maybe you would even want to bike the whole province of Alberta on one of these. Where to use Mountain Bikes Calgary? If you visit Vancouver, you might find the North Shore line has been built specifically for the steep, wet and rocky regions surrounding the city. It may be the best choice for heavy-duty mountain biking Canada has to offer. But what does Calgary have to offer? For mountain biking, the Calgary season runs during the milder weather that typically spans from the end of spring into fall. What bicycle opportunities exist in the region? Biking in Canada can be a beautiful experience using the thousands of kilometers of trails within Alberta. The system allows the cyclist access to logging and fire roads as well. When you enter the National Park areas for instance, be aware of those places where you can and cannot use your mountain bikes. Also be aware of bears when you are in bear country. Individual mountain bike routes range from less than 40 km to 600 km long. Park locations that include many of the favorite trails are: Bragg Creek, Canmore, Moose Mountain, Banff/Lake Louise and Jasper. Provincial parks include Cypress Hills, where trails intertwine the multiple lakes and span two provinces. Also a rider can partake in traveling through Edmonton and Calgary. Your mountain bikes Calgary favorites might encompass Nose Hill Park and Bowmont Park with trails exclusively for mountain biking. Pick up a Calgary bike path map to see these routes or see if you can find one online. These parks offer views of the grasslands and other sites within close proximity to hotels. In Fish Creek Park, Calgary bike paths take the cyclist along Fish Creek and Bow River within the city limits. More favorites allow you to ride your mountain bikes Calgary along Kensington to Prince Island or Glenmore Reservoir. For a quiet time visit River Park. Solitude and adventure await you in Calgary and Alberta, Canada. ...or go back from Mountain Bikes Calgary to the Calgary Downtown Map web page.